One of the best things about living in Hanoi, Vietnam, for the last five years is how perfect the city is as a base for exploring the north of the country. Along with vibrant, bustling cities, soaring mountains etched with ancient terraced rice paddies, and serene rivers that wind past mysterious limestone towers. My husband David and I have also discovered there are more than 30 villages in the greater Hanoi area alone that specialize in creating handicrafts using skills passed down from generation to generation for centuries. Discovering these traditional villages is not only an adventurous way to explore Vietnamese history and culture, but it can pay off too. Pick up the right artisanal products straight from the source, and you’ll get them at rock bottom prices. Stuff your bags with silks, textiles, and more and you can easily sell these at home or online for much more than you paid. It could be a perfect way to pay for the holiday of a lifetime. Most of the traditional villages are difficult to find. You won’t see signs in English or find many people who speak it either. The best deals and most authentic experiences are found in the places that don’t usually sell to foreigners. So, when visiting, plan for a car and translator. Van Phuc Silk Village is a traditional oasis; a countryside village now surrounded by the hustle and bustle of Hanoi’s southern suburbs. The artisans in Van Phuc have been producing high-quality silk fabric, scarves, and clothing for more than 1,100 years. The fine silk with its shining satin finish has been the inspiration for many Vietnamese poems and songs and has always been the fabric of choice for Vietnam’s aristocracy and elite. I went to Mr. Nguyen Van Chien’s home to learn about his craft. His family has been producing silk for well over 10 generations. All the Van Phuc artisans—including Mr. Nguyen—now use electric looms; an upgrade that gives the artists more consistent quality control and greater productivity over the traditional manually-operated loom. The high-quality silk he weaves has a thread count twice that of silk manufactured in China, India, and other silk-producing regions. Mr. Nguyen sells beautiful crushed-silk scarves for $3.24 apiece in quantities of 10 or more. If you want to buy them by the piece, he sells them for $5.80 each in the shops in the center of the village. Depending on your bargaining skills, they’re $6.96 or more when purchased in Hanoi retail outlets. Scarves similar to these are priced between $22.42 and $59.35 on eBay and Amazon. I saw them sell like hotcakes for $26 each during a trade show that I attended in Florida. Mr. Nguyen says that the beautiful silk satin scarves he sells for $5.80 retail in Hanoi for around $13. In the U.S., they easily sell from $40 to $100. His short-sleeved silk women’s blouses wholesale for $11.61 each; those same blouses cost $16.25 in the village shops, at least $20 in Hanoi, and from $40 to more than $130 in the U.S. 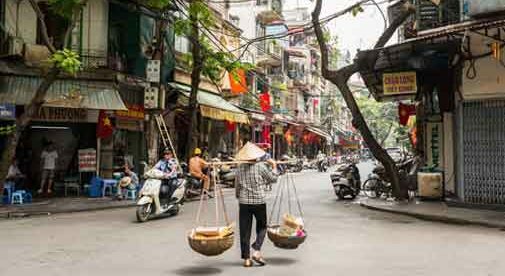 These big mark-ups between producer and the U.S. market mean that there is great potential for profit for anyone visiting Hanoi. With some extra suitcase space, you could make enough money from reselling these crafts on Etsy or eBay to pay for your entire trip to Vietnam, and with a little more commitment you could even turn it into a decent side-income.